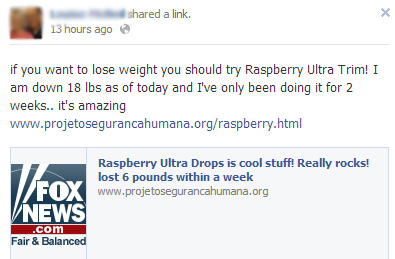 Raspberry Ultra for Healthy Fast Weight Loss! If you see this on a friend’s Newsfeed, or if it is posted directly to your wall, then there is a good possibility that your friend has been hacked or has a rogue Facebook application installed. We have seen this posting several times. There is most always a disclaimer from the Facebook account doing the posting claiming that they didn’t post it, and they don’t know how it happened. Accounts posting this message should change their password ASAP. This page is engineered to look like a Fox news site, but if you check the URL, you will see that it isn’t legitimate. 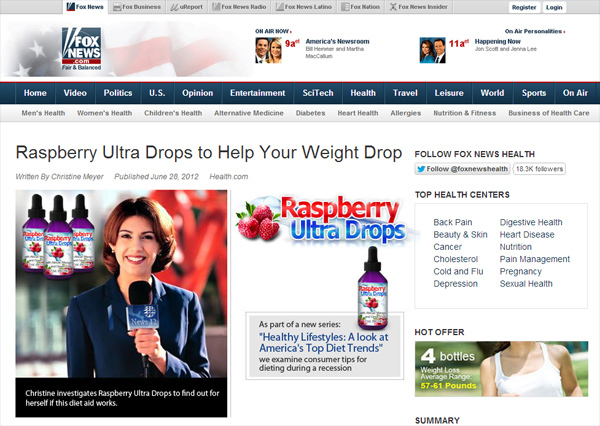 The scam page serves as an infomercial for Raspberry Ultra drops weight loss product. It appears the scammers are taking control of user accounts, and then spamming this message to their friends. The goal here is to use the trust you have in your friend’s endorsement and purchase the diet drops. We can’t speak to the legitimacy of the product, but considering the marketing methods employed, we recommend you steer clear of this product. You could likely find similar products far cheaper at a grocery or health food store.